Mr Key's vote of confidence in his prospective coalition partner came as Mr Dunne today said he had voted for the legislation he was being lobbied against. The Dominion Post reported that fishing magnate Philip Vela made a $5000 donation to United Future in 1999 after his representative, former MP Ross Meurant, lobbied Mr Dunne against a United Nations plan to protect fishing stock. Days after the August meeting Mr Dunne put out a statement questioning aspects of legislation that would ratify the UN plan and Mr Meurant sent Mr Vela a memo advising him to make a donation. "I believe there is merit in making good the advice you allowed me to give him last (time) Dunne and I met -- and that a donation would be made," papers supplied to the newspaper said. It also said Mr Meurant told Mr Vela the donation could lead to the MP's help with a tax issue the Vela company faced and with "access" to a parliamentary select committee. But Mr Dunne today rejected any suggestion he had discussed money with Mr Meurant or changed his party's policy in return for a donation. He confirmed his party received a $5000 donation about two months after the meeting, but he did not speak in the debate on the legislation and voted to pass it. "There is absolutely no suggestion of cash for policy here because we did not deliver on the policy and we never discussed the issue of funding and if that had been raised I would have terminated any meeting." He said the party had no dealings with the Velas relating to tax matters. "Mr Meurant's papers are reports to his masters and as such will obviously have gilded the lily to show what a good lobbyist he was. "They should be read with a large grain of salt." Mr Key has ruled out doing a post-election deal with New Zealand First leader Winston Peters over his handling of several murky donations -- including several from the Velas. National also repeatedly criticised Prime Minister Helen Clark for taking Mr Peters' word he had done nothing wrong in relation to NZ First's various funding scandals. 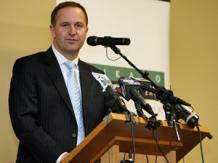 But Mr Key today drew a distinction between Mr Peters' actions and Mr Dunne's. "My only knowledge of it is what I read in the paper today. I accept his word, his vote is not for sale," he told reporters. "Mr Peters was proven in my opinion to have misled Parliament, he was censured by Parliament and let's face it he doesn't have a good grasp of the facts including whether he's been in a helicopter or not." Mr Peters yesterday implied on TVNZ's Agenda programme he had never used a helicopter to campaign. The statement came as he was questioned about whether he had ever demanded through Mr Meurant that the Velas provide him with a helicopter during the 1999 election campaign. But Mr Peters' denial was almost immediately shot down by photos of him walking out to get on a helicopter during the 1999 campaign. He also used a helicopter in 2005.